The service provided by dog groomers is a necessary and popular one; with the prospect of reasonable pay and conditions. Compared to other careers with animals, the hours are more regular and the tasks can be less physically demanding. Lift & Groom Table. Cost approximately £400-£500. On top of these larger items are things like brushes, overalls, ribbon, cleaning materials, brooms and tie-up hooks. Setting up the new grooming service in a shop may hold a few surprises! Local councils should be notified and regulations carefully checked, because planning permission is needed in some cases (change of use of building). This must be done in advance, which can cause added expense and difficulty, particularly if the people who are selling the property to the dog groomer do not want to have to wait for the sale to go through. Once the premises have been bought, or leased, the preparation begins! Sign writers, electricians, plumbers, plasterers, painter & decorators may need to work on it before the first piece of equipment can be brought in. Is the telephone connected? Other things to consider-publicity and advertising-no point having a wonderful premises with shiny new equipment if no one knows there’s a new dog grooming service there! Take bookings in advance to make sure an income from the business starts on the first day of trading. Mobile grooming businesses are becoming more and more popular. They have no fixedpremises, which saves on overheads and property-related expenses. The mobile grooming service goes to the client-enabling a greater area to be covered if needed and more flexibility. When the specially-adapted vehicle is on the road a greater number of potential clients are exposed to the existence of the service. Dog groomers have more control over the number ofdogs in their care at any given time. (Some clients are early dropping off dogs and late picking them up in the grooming salon premises). Depending on profitability of the business, the need for extra trained staff, or offer of apprenticeship, is a choice for the individual owner of the business. Trained assistants cost more but they are making money for the business. Inexperienced trainees cost less to take on,but are not producing any revenue for the business, and need the time and attention of the trainer in order to progress. This is why so many grooming services are one-person shows! That, and the fact that they do not want the added hassle and expense of having wages to sort out, or the need to be VAT registered. Lifting heavy wet dogs, removing ticks and sweeping up all that hair, is by no means glamorous work. Good communication skills are needed-after all it is the dog’s owner that wants their precious pooch bathed, clipped and beautified-not the dog! Calm, kind, handling of all dogs, including timid, snappy and those who would generally prefer to be anywhere else, is important, too. Job satisfaction comes when the finished result of the groomer’s labours are evident and relationships built with regular clients and their dogs. 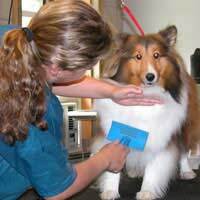 Knowing thatthey have taken professional pride in each animal’s appearance and transformed them by using their skills and experience is where the dog groomer’s real satisfaction comes. For the inexperienced beginner work is hard and repetitive and the wages low. An experienced and well established dog groomer will have built up speed, accuracy, finesse anda good judgement on how long each dog will take. As a rough guideline they may earn between £11,000 and £14,000 per year. (Regional variations to be considered). Thanks for the useful information about dog grooming and walking. Although I don't think I'd be up to walking all those dogs at once!